To be honest, I was a bit weary when walking in for ‘Ek Thi Daayan’, another Bollywood horror flick and the director Kannan Iyer among his other noticeable work had co-written RGV’s ‘Daud’. However, what lured me to watch the film was the fact that it boasted of some awesome collaboration; Konkona Sen Sharma playing the female lead, music by Vishal Bharadwaj, lyrics by Gulzar and the original short story had been written by Mukul Sharma (Konkona’s father). Konkona is back on the big screen after a brief hiatus and she has just got better. She had said in her interview that she had enjoyed playing a dark, twisted character and it is quite obvious. The way her character evolves from the kindly governess, it is like watching each layer peel away to reveal a completely new layer of the talented actress. Konkona is a dusky seductress – gentle and vicious at the same time, essaying an uninhibited performance that is worthy of praise. Sometimes, only her eyes speak, especially in the scene where she is offended by Little Bobo’s outburst, she says nothing but her eyes well up and she walks away, despite your many suspicions, you feel for her. Emraan Hashmi plays the famous magician Bobo who seeks psychiatric help after his hallucinations threaten to tear his life apart. 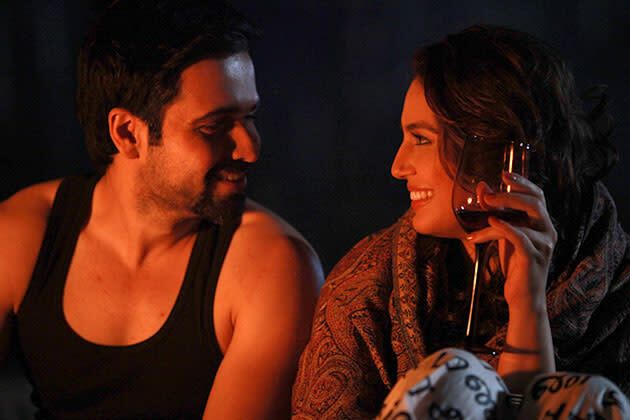 Emraan has definitely come a long way from his serial kisser days. He does a commendable job as the troubled magician, battling with past memories of his kid sister’s accidental death and struggling to come to terms with the present – has the daayan returned or was it always his imagination? Emraan’s restrained performance is the best of him I have seen so far. Huma Qureshi is good as Emraan’s conflicted girlfriend; trying really hard to convince her fiancé/husband that his fears are nothing but superstitions. Initially it is a little difficult to grasp why she isn’t more considerate but later it all falls into place. While Huma’s “permission” dialogue (Gangs of Wasseypur) still remains the most memorable, she manages to look quite gorgeous as Tamara in ‘Ek Thia Daayan’. It’s obvious that much thought was put into the writing, despite being a non-believer in the supernatural, there will be parts that will send your pulse racing. I wasn’t too impressed with the way the climax was handled but through most of the story Kannan Iyer builds up the suspense well. This film is far ahead of any of the recent horror films that you have watched. Watch it especially for the performances.